O gracious God, we remember before thee this day thy servant and apostle James, first among the Twelve to suffer martyrdom for the Name of Jesus Christ; and we pray that thou wilt pour out upon the leaders of thy Church that spirit of self-denying service by which alone they may have true authority among thy people; through the same Jesus Christ our Lord, who liveth and reigneth with thee and the Holy Spirit, one God, now and for ever. O gracious God, we remember before you today your servant and apostle James, first among the Twelve to suffer martyrdom for the Name of Jesus Christ; and we pray that you will pour out upon the leaders of your Church that spirit of self-denying service by which alone they may have true authority among your people; through the same Jesus Christ our Lord, who lives and reigns with you and the Holy Spirit, one God, now and for ever. James the son of Zebedee and his brother John were among the twelve disciples of Our Lord. They, together with Peter, were privileged to behold the Transfiguration (M 17:1 = P 9:2 = L 9:28), to witness the healing of Peter's mother-in-law (P 1:29) and the raising of the daughter of Jairus (P 5:37 = L 8:51), and to be called aside to watch and pray with Jesus in the garden of Gethsemane on the night before His death (M 26:37 = P 14:33). James and John were apparently from a higher social level than the average fisherman. Their father could afford hired servants (P 1:20), and John (assuming him to be identical with the "beloved disciple") had connections with the high priest (J 18:15). Jesus nicknamed the two brothers "sons of thunder" (P 3:17), perhaps meaning that they were headstrong, hot-tempered, and impulsive; and so they seem to be in two incidents reported in the Gospels. On one occasion (L 9:54ff), Jesus and the disciples were refused the hospitality of a Samaritan village, and James and John proposed to call down fire from heaven on the offenders. On another occasion (M 20:20-23 = P 10:35-41), they asked Jesus for a special place of honor in the Kingdom, and were told that the place of honor is the place of suffering. Finally, about AD 42, shortly before Passover (Acts 12), James was beheaded by order of King Herod Agrippa I, grandson of Herod the Great (who tried to kill the infant Jesus--Matthew 2), nephew of Herod Antipas (who killed John the Baptist--Mark 6--and examined Jesus on Good Friday--Luke 23), and father of Herod Agrippa II (who heard the defence of Paul before Festus--Acts 25). 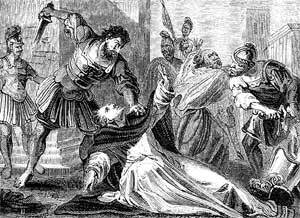 James was the first of the Twelve to suffer martyrdom, and the only one of the Twelve whose death is recorded in the New Testament.